Stavo assemblando la Moon phases n.02, quando inavvertitamente ho dato un colpo con la mano alle lune laterali, che si sono spostate sopra la luna piena, andando a creare proprio le linee che vedete in queste foto :) quella nuova soluzione del tutto casuale mi è piaciuta talmente, che mi sono subito appuntata un bozzetto nel mio quaderno, per ricordarmene e realizzarla in seguito. Et voilà, ecco la Moon phases n.03! Che ne dite? Vi piace? A me questo modello piace davvero molto! Le fasi lunari sono in ottone martellato e lavorato a mano, assemblato con pietre dure sfaccettate di calcedonio e perle in vetro sfaccettato. Fa parte della serie "Moon paths", collezione Spirit of Earth. 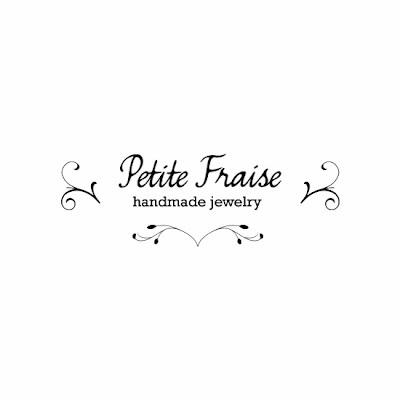 Disponibile su Etsy, DaWanda, ALittleMarket. 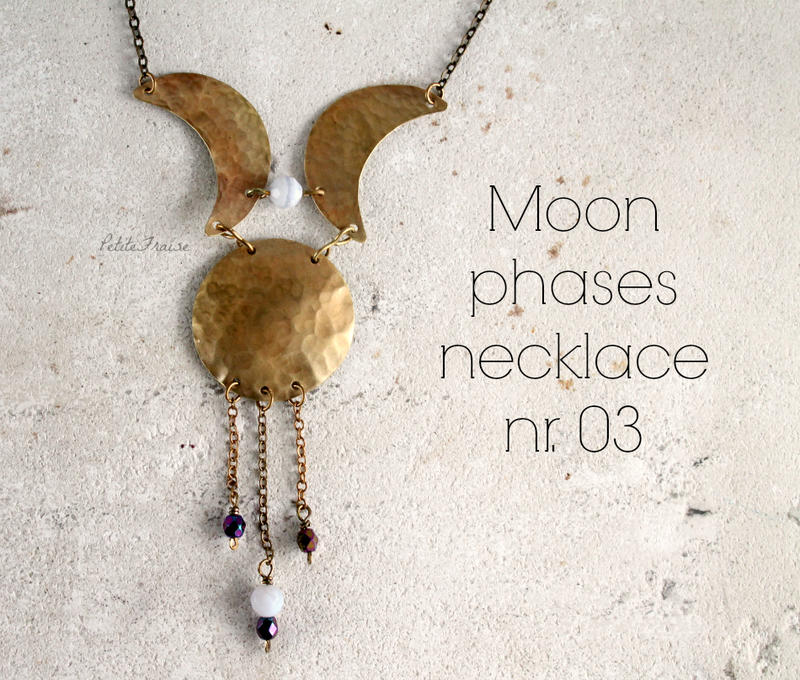 After the Moon phases necklace nr.01 and after the Moon phases necklace nr.02... finally the nr.03 has arrived! This necklace is born by chance. 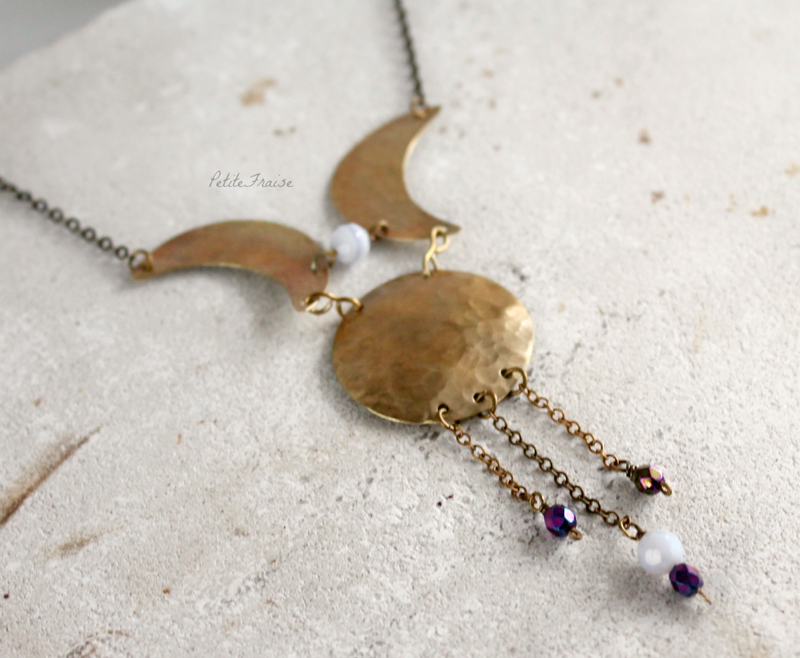 I was assembling the Moon phases necklace nr.02 when the two crescent moons shifted by mistake above the full moon, creating the lines you can see in these pictures :) I loved this new casual solution very much, so I made a doodle of it, to make it later. 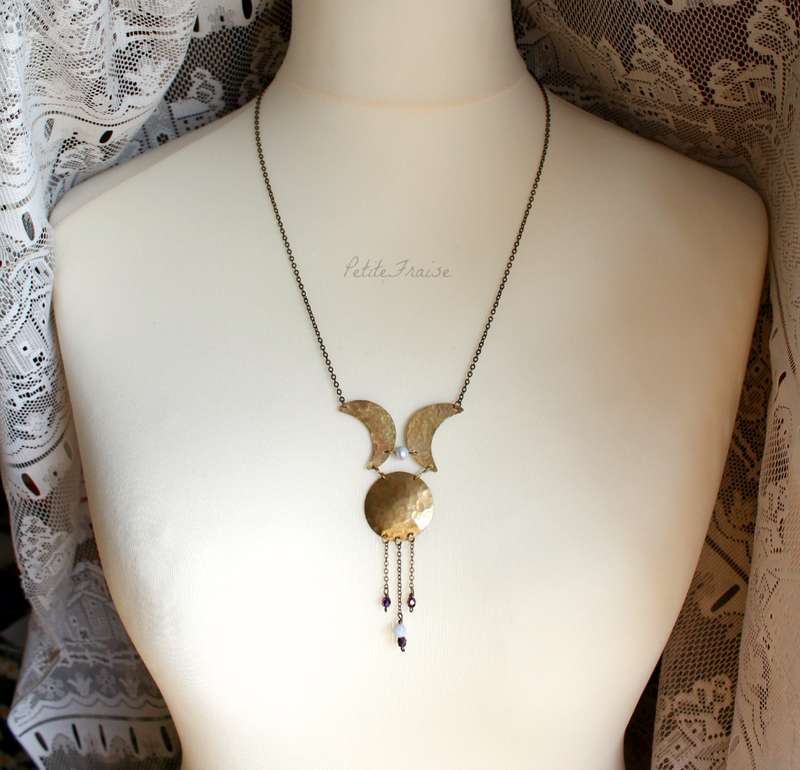 Some days after the Moon phases necklace nr.03 is born! Do you like it? I love it very much. 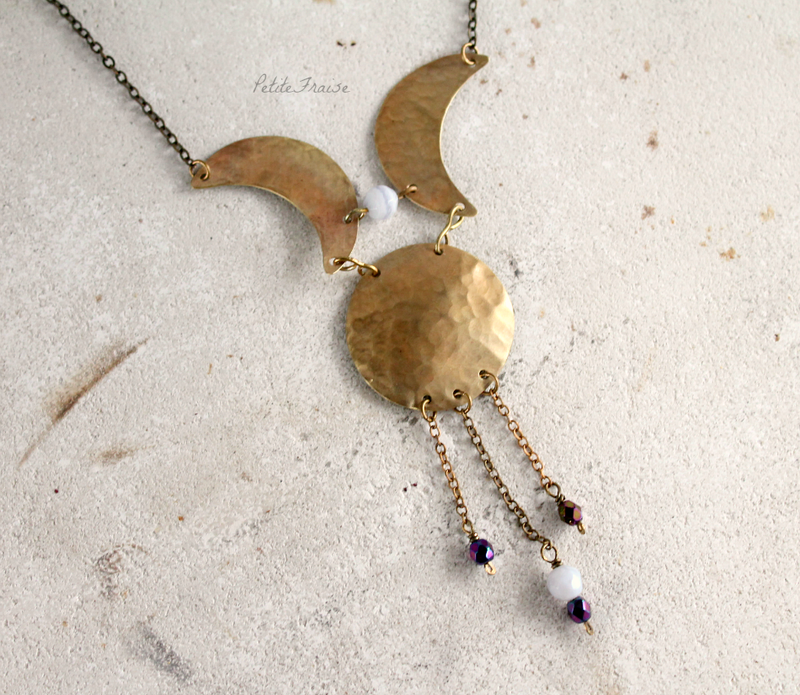 The moons are in hammered brass worked by hand, assembled with faceted chalcedony gemstones and faceted glass beads. 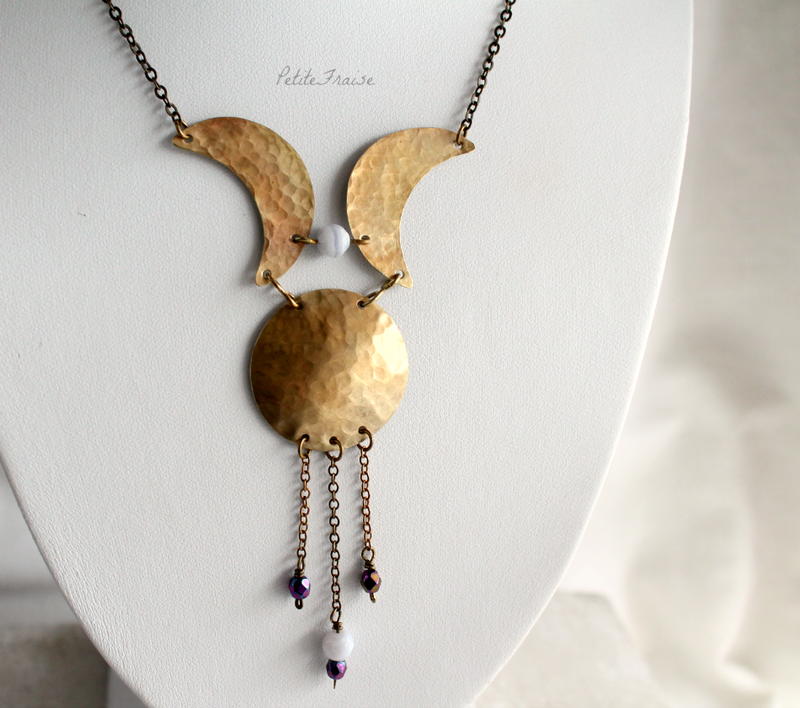 It's part of the "Moon paths" series, Spirit of Earth collection.